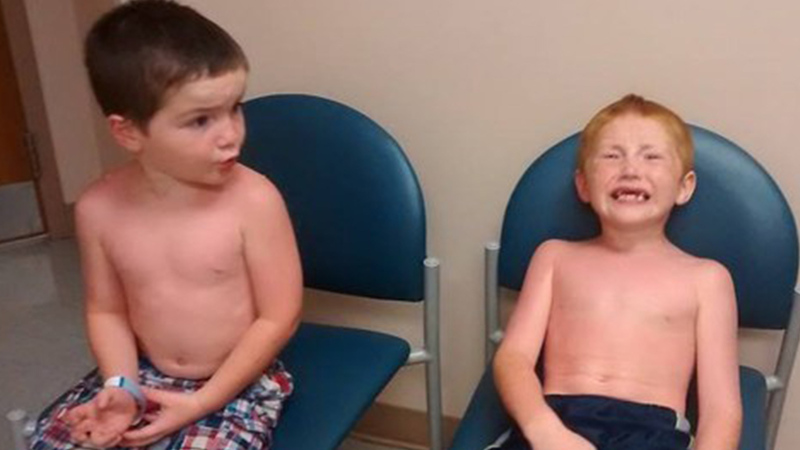 Two young boys are hospitalized in Texas after receiving severe sunburns from a day care trip to a water park. Shaunna Broadway dropped off her sons Conner and Trey, ages 7 and 5, at the Happiness Is a Learning Center in Vinita, Okla. last Friday morning for a planned trip to a local water park. When Shaunna arrived to pick them up at the end of the day, she found the boys were badly sunburned. 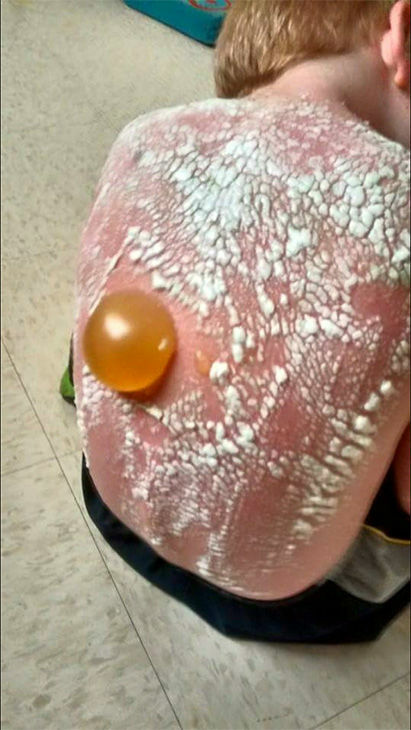 A single mother was horrified to discover her children suffered second and third degree sunburns after a day care trip to a water park. According to Wayne, the day care did not provide sunscreen. The staff reportedly told the boys to keep their clothes on, but says they didn't listen. The single mother called the local emergency room, but they couldn't do much until the burns had blistered. Instead, she got Silvadene cream and pain medication, but the boys were in pain all night. Shaunna's father, Wayne Broadway, said the day care did not provide sunscreen while at the water park, and staff told the boys to keep their clothes on, but they didn't listen. Wayne told ABC that one of the day care employees was making fun Conner for crying, saying he was being "a baby" about it. When the burns began to blister early Saturday morning, Conner and Trey were in excruciating pain. She brought her boys to the ER, where the doctors lanced the boils and blisters on their backs, applied cream and sent them home with more pain meds. When Conner began to complain of chest and breathing pain, Shaunna brought them to Hillcrest Medical Center in Claremore, Okla. for another opinion. The boys were transferred to Hillcrest's burn center in Tulsa before being flown to Shriners Hospital for Children in Galveston, Texas. After visiting the Hillcrest Medical Center in Claremore, Okla., the boys were eventually flown to Shriners Hospital for Children in Galveston, Texas. Trey suffered second degree burns and "is doing much better," said Wayne. But Conner, being redheaded with fair skin, suffered second and third degree burns on his back. Conner was wrapped in a back and chest cast on Monday, and will remain wrapped for at least 72 hours. Police and the department of health are currently investigating the matter for criminal neglect, says Wayne. Wayne's cousin, Jerry Broadway, created a GoFundMe page to help with the treatment costs for Conner and Trey, which has since received $4,000 in donations. ABC reached out to The Happiness Is a Learning Center for comment, but no one answered the phone at the day care center at the voicemail is currently full.